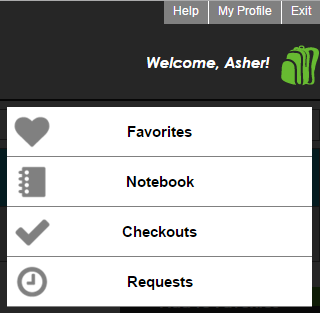 What is the difference between my Favorites, Notebook, Checkouts and Requests? Favorites is a place to save titles for future reading. Notebook is where you can view all the notes you’ve written about titles. Checkouts is where you can see a list of titles you currently have checked out along with return dates. Requests is where you can see a list of titles you’ve requested to check out because they were unavailable. In other words, your Requests page contains all the titles for which you are on a waiting list. You can also see titles on hold for you (titles ready for you to check out).